While not covers for espionage, Beijing’s cultural centers should be scrutinized. Often linked with propaganda or the historical communist and nationalist alliances against warlords and the Japanese, “united front work” also refers to Beijing’s efforts to mobilize friends and isolate enemies. The Chinese Communist Party (CCP) from its inception was only an elite group of dedicated cadres faced with the problem of how to mobilize the great majority outside their circle. As Mao Zedong characterized the problem in 1926: “if the Chinese revolution…has shown such meager results, it is not the goal but the tactics [that] have been wrong. The tactical error committed is precisely the inability to rally one’s true friends in order to strike at one’s true enemies.” Ideally, those true friends identify and isolate enemies while hiding the CCP’s hand and giving the appearance of independent action. Calling what the Confucius Institutes do “united front work” seems conspiratorial. 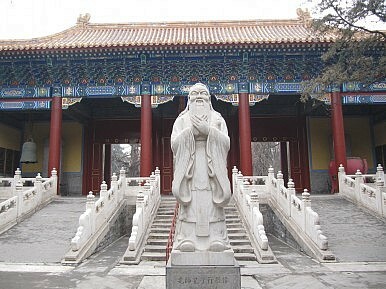 Funded by an affiliate of the Chinese Ministry of Education, the Confucian Institutes’ stated mission is “to satisfy the need of people who are interested in Chinese learning all around the world, promoting the understanding of Chinese language culture, enhancing the educational and cultural cooperation between China and the world, developing the friendship between China and other countries, to help developing a multicultural environment and building up a harmonious world” (sic). Most Confucius Institutes are attached to universities, and they are operated with a combination of local and Chinese support. They do not compete with university programs, but augment existing language courses and cultural exchange efforts. Confucius Institutes also support primary and secondary school Chinese-language classes. Regardless of Beijing’s motives, China has pumped millions of dollars into funding these institutes—creating more than 300 institutes toward the worldwide goal of 1,000 by 2020. The risk to this investment if the Confucian Institutes were exposed for hosting spies is probably the single biggest reason to believe they are not being used for espionage. They offer no benefit to China’s intelligence apparatus that Beijing does not already have. Its intelligence services already use diplomats, journalists, civic organizations, businesspeople, and possibly even academics in their operations. So there is little reason to suspect that Chinese leaders would disapprove automatically of using the Confucius Institutes. Persistent allegations of Chinese embassy interference in Chinese student associations already suggest Beijing keeps tabs on its students. And some are rumored to be debriefed by Chinese intelligence upon returning to China. As for economic espionage, using an official Chinese organization surrounded by controversy to gain access to proprietary research held on college campuses would only prove the worst accusations leveled at Beijing. And China’s burgeoning cyber capabilities offer a more easily deniable pathway to that same data. With so many other ways of gathering information, Beijing has plenty of reasons not to allow its intelligence services to jeopardize its investment by discrediting the Confucius Institutes. No security service has uncovered any such shenanigans since the creation of the Confucius Institutes in 2004. Nor have the post-Mao Chinese intelligence services demonstrated the power and prestige once shown by the Soviet KGB that would allow them to force their way into this program. The Confucian Institutes also are too open for scrutiny to be a font for overt propaganda, even of the soft kind published in the China Daily. Chinese cultural programs, sponsored lectures by Chinese and non-Chinese experts, and more accessible Chinese-language courses are hardly fodder for direct influence. This almost makes “united front work” seem absurd, but there is enough substance to this idea that it should be tested. Most tellingly, the head of the Confucius Institutes’ parent organization, State Councilor Liu Yandong, served as the head of the CCP’s United Front Work Department (2002-2007). There are other reasons to question the institutions, however. For example, defenders of the Confucian Institutes compare them to the Goethe Institute, the British Council, and the Alliance Française. Without touching the thorny issue of moral equivalence, Confucian Institutes are operating in a different context than their Western counterparts. The Western institutes are political organizations operating in a political context outside university walls, allowed in only when universities find their activities appropriate. The Confucian Institutes, however, are political organizations wrapping their activities within the legitimacy of universities as public, apolitical institutions. If the Confucius Institutes really are part a new “united front” campaign, then who are China’s enemies today? They largely consist of two groups, repeatedly identified in the official press: the so-called “Five Poisons” and “Western hostile forces.” The former includes Taiwan, separatist Tibetans and Uighurs, the spiritual group Falun Gong, and democracy advocates. “Western hostile forces” often is a euphemism for the United States, but conveniently describes the hidden enemies who “foment social unrest” and try “to Westernize and divide China.” It also could be extended to those who view Beijing’s intentions with skepticism—or, in Beijing’s terms, with a “Cold War mentality”—such as those China experts who have raised the above concerns and who administrators have frozen out of their universities’ China-related programs. The full implication of the Confucian Institutes program is not yet clear; it is difficult to say whether it truly represents a new “united front” campaign. Concerned inquiry does not mean they should be abandoned altogether, because many of the programs are useful when managed properly. However, given the nature of the institutes’ relationship with the Chinese government—and especially when a senior Chinese leader has called them an important part of China’s international propaganda effort—the Confucian Institutes deserve careful scrutiny and probably do not belong ultimately on university campuses. “United front” work succeeds because it is hidden, making it difficult to determine who is speaking for what cause and with what motivation. Monitoring the content of Chinese language education is also necessary. The concern is not whether students learn about Tibetan history or the truth of Mao’s revolution in their language lessons. Concerned citizens instead should wonder how the CCP and the Chinese government are portrayed—just as Hong Kong parents have questioned the value of national education. Totalitarianism is about controlling the rhythm and language of discussion, of subsuming familiar concepts in the service of the state. The use of Confucius to promote Chinese culture is a perfect example of this totalitarian assimilation. Contrary to the presumed emphasis on obedience—the preferred reading of Chinese rulers since the Han dynasty—Confucian thought emphasizes virtue above all else, granting subjects the right to rebel when authority figures cease to be virtuous. This makes Confucius an ironic choice as an international symbol for a state that, since 1990, has had 18,000 officials flee with an estimated 120 billion dollars in government funds. It is one thing to accept different points of view; however, it is another thing entirely to allow Beijing to determine how China is discussed internationally and how students learn about it. China’s leaders after all belong to a party based on a foreign ideology that once tried to wipe out traditional Chinese culture. The country’s rich cultural heritage stands on its own merits and many foreigners can learn a great deal from it. Depoliticizing foreigners’ exposure to China’s culture and history can be only a good thing. Peter Mattis is Editor of China Brief at the Jamestown Foundation. Beijing is expanding efforts to enhance its soft power. Events at home illustrate why such moves are headed for trouble.